Imagine if you put a clock divider, clock multiplier, step injector, time shifter, clock shifter, pulse-width modulator, and an arithmetic probability processor under the control of a single knob. Now what would happen if you fit 16 of these knobs into a single module and have them interact? YOU WILL HAVE A RIOT, A TRIGGER RIOT! With so much going on in eight channels, simply tweaking a few knobs builds new sequences, causes patterns to evolve, and makes streams of triggers and gates come pouring out of the outputs! 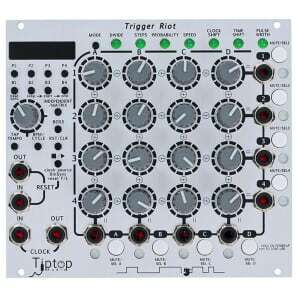 The Trigger Riot is an innovative sequencer that uses a unique method to clock modular synths that has never been seen before. It can be used to time modulation sources like the Z4000 envelope generator, Z8000 CV sequencer, and many others! 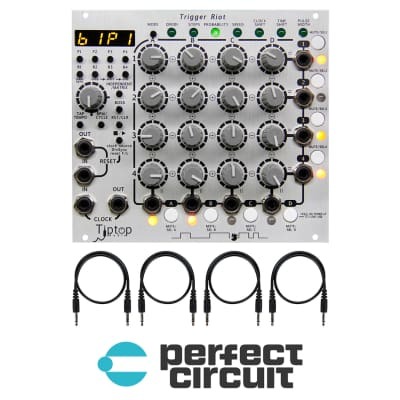 It can also be used to trigger our complete synth voices and drum modules in tandem, creating the world’s first fully modular drum machine in the heart of the Tiptop system, a modular groove composer of a new age. 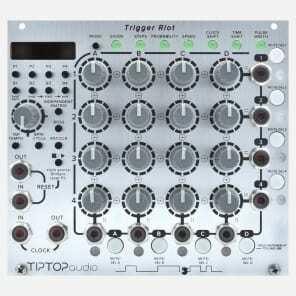 Some of the Trigger Riot features include: non-volatile memory for patterns, synchronization with external gear, smart synchronization of multi-Riot setups, DIN Sync for vintage gear, a precise internal tempo clock generator, tap tempo, preset looping, and sequencing of independent channels or matrix sequencing for a real trigger madhouse! 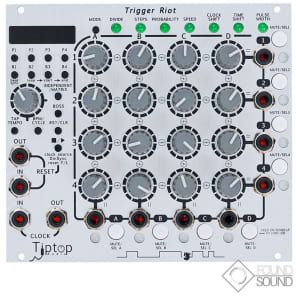 From a conceptual view, the Trigger Riot generates 16 clock streams consisting of multiple time manipulation functions (division, offsets, etc) that interact to create the trigger output, and direct access to each parameter via individual knobs allows for quick manipulation. The 8 outputs are the sum of those manipulated streams per row. The outputs of the module are arranged as either a 4x4 matrix, where each of the 16 knobs affects both row and column, or as a set of independent outputs for each row or column. This allows forming 8 complex musical interactions in a ‘Matrix’ mode or 8 independent streams in ‘Independent’ mode and is switchable from one to the other on press of a button for some unexpected results. 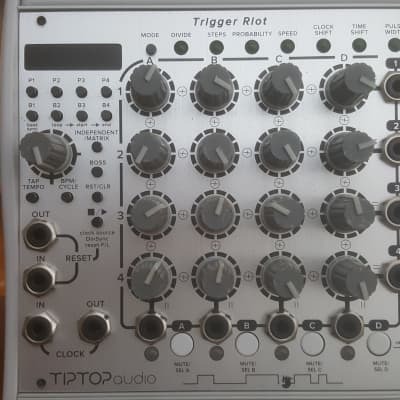 Since each of the 16 knobs represents a real time tweakable trigger generator/modifier the Trigger Riot is extremely playable and can result very complex patterns with only few knob turns; patterns that would otherwise take much longer and in some instances be almost impossible to produce using grid based step sequencing. Patterns can have unique time signatures that can repeat or be randomized through probability, time shifted and phased, divided, multiplied and counted, it’s unbelievable how complex this module can get with minimal input. Speed: Multiply or Divide the clock streams in sub clock particles based on 24 PPQ, breaking up the standard grid values. Probability: Sets the odds of a trigger firing which makes more varied and less rigid patterns or can create subtle accents and fills. Pulse Width: Sets the pulse width of each stream, creating overlaps and as a result all kind of odd time signatures; also great for sustaining envelopes or for programming a high pulse fro some time. Clock Offset: Moves the trigger streams in time to change the relationship between streams. Streams can be set to the same amount but offset to trigger in between each other rather than simultaneously to create syncopation effects. Time Shift: Shifts the triggers streams variably in between clocks for swing type feels and off the grid patterns. Step: Places single shot triggers on individual clock ‘Steps’ to trigger events once per pattern. This can also be seen as a pulse counter. Mute/Sel: Muting of each trigger output for live dub mixing or to select which row to edit in ‘Independent’ mode. Tap tempo: Tap in your own time. The Trigger Riot features 4 banks of 4 presets for saving, and instant recall of patterns with any level of complexity making it a real time sequencer. Patterns and banks are not volatile and can be loaded for stage or studio sessions on power up. Several riots can be synced together with all control signals shared based on a master reset, clock, and pattern across multiple units and even synced with the Circadian Rhythm sequencer. 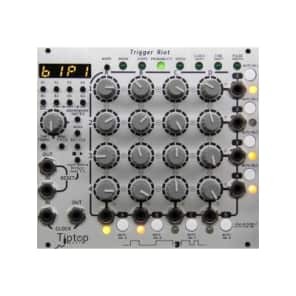 In addition to that, a master touch controller is in development which can control up to 4 Riots for the ultimate in hardware sequencing for Tip Top’s wide array of drum and synthesis modules (of course, it works great with every other module too). A little bit of what going on under the hood: The Trigger Riot is made with the latest in high-end microprocessors and a special combination of hardware and firmware technology designed to achieve unprecedented levels of timing and extreme types of pattern complexity.